As we head into fall in the Northern Hemisphere, springtime comes to Australia's largest city, bringing beautiful weather, more affordable lodging and airfare and fewer crowds. Routinely ranked among the most stunning cities in the world, Sydney is a long flight from almost anywhere but one look at Sydney Harbor is all it takes to make the trip seem worthwhile. The Harbor hums with activity, whether it's the family friendly zoo and aquarium, renowned fish market, the heart-pounding bridge climb, rum at The Rocks or the ferries that have been operating since 1789. The restaurant choices reflect the city's multicultural makeup with uniquely Australian grub like emu, crocodile, anzac biscuits and vegemite offering a distinctly local flavor. Day trips to wine country and the UNESCO Heritage Blue Mountains site, are readily available. Like most major cities, Sydney warrants at least 3 to 5 days for experiencing the highlights. On a budget? Then take a walk through Sydney's flashiest playground at Darling Harbour and enjoy people watching or ducking into shopping centers. Most of the attractions here - the Chinese Garden of Friendship, the eight-story LG IMAX Sydney (the world's largest cinema screen), mini-golf, Powerhouse and Australian National Maritime museums, Sydney Aquarium, Sydney Wildlife World, and numerous theaters - have admission charges. But exploring Sydney Galleries and Wentworth Gallery Four Points, simply roaming along Darling Walk and Pyrmont Bridge, or resting in Tumbalong Park are all absolutely free, as is watching the world's largest interactive light display Tuesday through Sunday in LUMINOUS at Darling Quarter between 6pm-11pm. With over 20 bars and restaurants lining the quays, Darling Harbour is the perfect venue to enjoy the weekly firework displays that kick off around 8.30pm most Saturdays (check http://www.darlingharbour.com for dates and details). 40 mins from the airport; take the train to Museum Station then the monorail to the Harbourside. 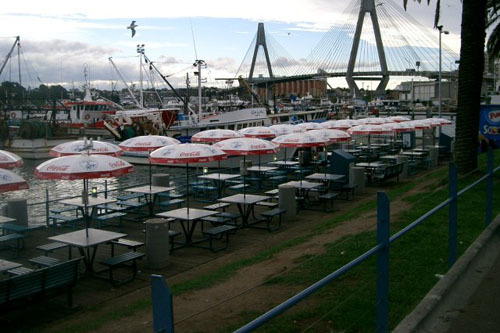 The largest authentic fish market in the southern hemisphere is at Pyrmont and has been trading since 1945 - it is second in size only to Tokyo's famous market. It comprises a working fishing port, a bustling waterside wholesale market, and fresh-food retail market, showcasing around 100 species of fish and seafood - 65 tonnes - daily. Aquatic specimens arrive each weekday afternoon at around 3pm daily and are sold off by Dutch clock auction the following morning from 5.30am. Auctions are accessible only by taking a Behind the Scenes Tour on Monday, Thursday, and Friday at 6.40am (book in advance on +61 9004 1143); otherwise the market opens to the general public at 7am. Most weekends there are hosts of activities from cooking demonstrations to specialist food festivals. After exploring the fish market, choose your lunch from fresh Sydney rock oysters, sushi and sashimi, or delicious organic cheeses from the enticing food stalls and counters, or book ahead to try your hand at cooking salt-and-pepper prawns at the adjacent Sydney Seafood School. Reaching skyward above the harbor, the iconic white scallops of the Sydney Opera House are required. Recently designated a UNESCO World Heritage Site, this architectural masterpiece can be reached by a direct 20-minute train ride from the airport to the Circular Quay rail stop. Gaze at it from outside, join one of the hour-long tours that start every 30 minutes, or attend an evening concert or performance. 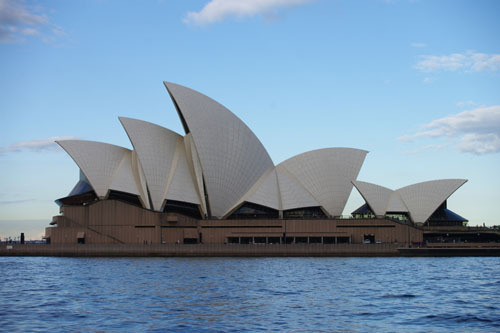 To admire the Opera House like a Sydneysider, catch a ferry from Circular Quay and view the landmark from the water. Bring a camera. From Manly Beach, hikers can take the scenic route up a well marked trail to North Head, rising 90 metres above the Tasman Sea, at the entrance to Sydney Harbor and part of Sydney Harbor National Park. A bus will get you up the hill in a few minutes but walkers with a couple of hours to spare will be rewarded with panoramic views of the city, harbor and endless ocean vistas from multiple vantage points. Home to 140 native plants and 90 species of birds, this delicate environment has a mesh trail or 'track' to protect the fragile vegetation. 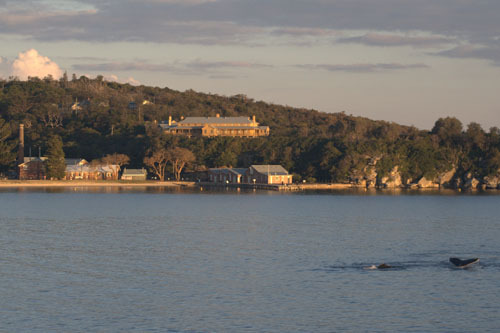 Military buffs will enjoy the North Head Artillery Museum and the defense fortifications along the trail that were used in WW II to protect Sydney. A tea room at North Head offers light refreshments, including traditional English cakes and scones. The world-famous Bondi Beach is a crescent-moon of golden sand facing the Tasman Sea; it's backed by plenty of shopping opportunities along Campbell Parade, and some of Sydney's best restaurants. The sea is pristine and the sand soft and the beach becomes rammed in summer with swimmers, surfers, sunbathers, and sporty types playing volleyball. Surfing virgins can hire equipment and tuition from several points along the beach. 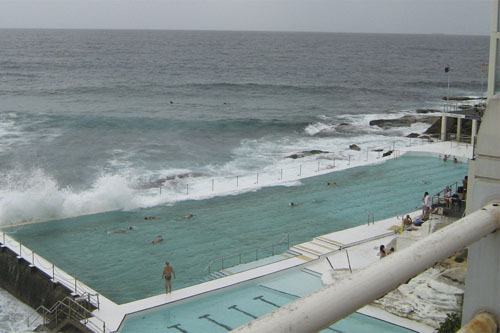 Bondi's Icebergs Pool lies at the west end of the beach on rocks; it's so close to the sea that waves often spray right over its eight swimming lanes. There's also a shallow pool for youngsters and novices as well as changing rooms. The gorgeous Iceberg Dining Room and Bar overlooks the pools and has all-encompassing views over the sweep of Bondi. If you appreciate more tranquility with your sunbathing, take the coastal walk to Tamarama, a little sickle-shaped beach with a fearsome riptide for adventurous surfers. Nearby Bronte Beach caters for families with a free pool, BBQs, and picnic areas. Warning: All Sydney's beaches are patrolled by lifeguards and it's always wise to check conditions with them before launching into the sea; as a general rule always stay between the yellow and red flags. Buses run to the beach from Bondi Junction throughout the day - parking is difficult. The ride from Circular Quay takes 45 minutes. See Sydney's most famous icons in just one morning! Cross the Sydney Harbour Bridge, for views of the world renowned Sydney Opera House at various vantage points, before strolling along Manly Beach and other picturesque surf spots on the Northern Beaches, to watch the waves from the Pacific Ocean roll in. Complete your morning with an optional lunch cruise on Sydney Harbour. Tour through the northern leafy "beach suburbs"
Conclude your morning at either King Street Wharf or Circular Quay or why not spend more time at Manly's surf beach playground and catch the ferry back to Sydney (own expense)? Climb the Sydney Harbour Bridge with an expert guide for the ultimate Sydney experience. Get amazing views and learn all about the iconic structure during your climb to the 440-foot (134-meter) summit. You have several options for your climb, including a sampler tour that goes halfway up. No matter which option you choose, ascending this famous landmark gives you a spectacular perspective on Sydney and an exhilarating sense of achievement. Each BridgeClimb is limited to a maximum of 14 participants to ensure personalized attention in a small group. Your BridgeClimb experience starts at the Sydney Harbour Bridge Visitors Centre where you meet your guide, receive a comprehensive safety briefing and put on the provided BridgeSuit, a specially designed coverall worn over your clothing. When you’re ready, follow your expert Climb Leader through a purpose-built tunnel that leads to the bridge. Securely clipped into a safety wire, start to climb the steady incline up the arches of the bridge, traversing catwalks and ladders all the way to the 440-foot (134-meter) summit. 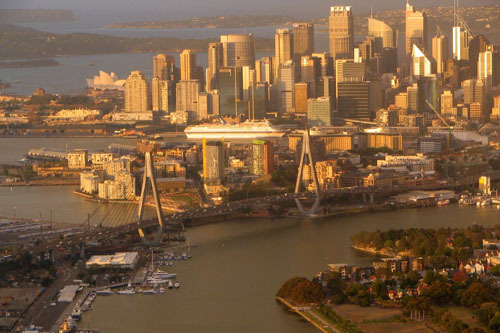 At the top, stop to admire panoramic views of Sydney and its surroundings. To the east you can see the sails of the Sydney Opera House and to the west the majestic Blue Mountains are visible in the distance (on a clear day). Throughout your tour, you can hear your guide via provided headsets. Listen to informative commentary and fun stories about the history of Sydney and the bridge and receive plenty of encouragement during your climb. Your guide stops at scenic points along the way so that you can take in the sights. The 3.5-hour BridgeClimb is suitable for people with a moderate level of fitness. The 2.5-hour Express Climb proceeds at a faster pace with fewer stops. The 1.5-hour Sampler Climb goes to a halfway point inside the inner arch before returning to the ground. Select a VIVID Climb available during festival dates only. After all tours, receive a complimentary group photo, commemorative certificate and BridgeClimb cap. Please see more details about each tour under Itinerary below. Explore the best of what Australia has to offer with an Australia Multi-City Attractions Pass. See more and save up to 50% on admission to Australia's favorite attractions, tours, cruises and things to do, all on one easy-to-use card! You will receive either five, seven or ten tickets (your choice), loaded on a smartcard for entry to top attractions in Sydney, Melbourne, Brisbane, the Gold Coast, the Sunshine Coast and destinations throughout Tasmania. Use your tickets all in one city, or spread them over as many cities as you can. You have an entire three months to use your tickets from the date of card activation. With the Australia Multi-City Attractions Pass, you can see Australiaâ€™s best attractions at your own pace. There are more than 140 attractions and activities to choose from, allowing you to create your own itinerary and save up to 50% on top attractions, tours, museums, venues and more in Australiaâ€™s most popular destinations â€“ Sydney, Melbourne, Brisbane, the Gold Coast, Cairns, Sunshine Coast and Tasmania. Youâ€™ll also be provided with a pocket-size guide full of information on the attractions, including their locations, opening hours and offers. Leave the bustle of Sydney and spend a relaxing day in the beautiful Hunter Valley on a guided wine-tasting tour in Australia’s oldest wine producing region. Enjoy a delicious lunch paired with wine, take a private tour of a vineyard, and savor tastings at several wineries. Learn about the the wine making process from your experienced guide and have the option to sample locally crafted beers. Wrap up your day with a visit to the elaborately landscaped gardens and boutique village at Hunter Valley Gardens. You’ll leave Sydney in the morning and travel about two hours to the Hunter Valley, getting magnificent views of the Hawkesbury River as you approach the valley. Keep an eye out for the remains of a convict-built road that winds into the hills. With a reputation for fine wine and other edible delights, the Hunter Valley is a wine and food lovers dream, and your knowledgable guide will show you the best spots. Your first stop will be Hope Estate where you can sample their award-winning wines and hear about their history in the region. Head to Hunter Valley Resort for a delicious lunch with a selection of lamb, chicken, salmon or vegetarian dishes specially paired with wines to compliment the meal. The resort sits among 40-year old shiraz vineyards on 70 secluded acres in the heart of Hunter Valley. Enjoy the ambiance as you sip wine and take in the surroundings. After lunch, visit McGuigan Wines to sample their wines. Established in the 1880's McGuigan Wines is now one of the most awarded wineries in the world having won 'worlds best best winemaker' three times. Wrap up your day in Hunter Valley with a stop at Hunter Valley Gardens. Walk through some of the magnificently landscaped gardens, tantalize your taste-buds with artisan chocolates, or enjoy a coffee at one of the many cafes (own expense). You can even sample wine, beer or liquors at The Garden Cellars (own expense). 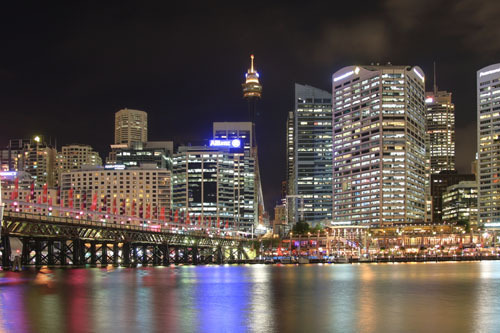 After a full day, relax on the ride back to your Sydney hotel.